Set in Galston Ayrshire, Scotland, Loudoun Castle Theme Park was originally constructed to serve as an amusement park for all ages. Starting in 1995 with the slogan "Scotland’s Best Family Theme Park,'' the park was introduced to the public through a company based in London rather than from Scotland itself. Since then, Loudoun Castle Theme Park had been passed over to multiple owners over the years which included showman Raymond Codona and Henk Bembom's Parkware Ltd. 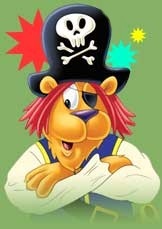 Nonetheless, the park's target audience remained intact, most exemplified by the presence of its cartoon animal mascot Rory the Lion on both its official logo and website. An additional component behind Loudoun Castle Theme Park's appeal in its marketing and attracting tourists was the fact that the park was named after the very same castle in Loudoun that it stood behind. As for the original Loudoun Castle, it was mostly constructed itself in 1807 through means of portions taken from a keep dated around the 15th to 16th centuries. Unfortunately though, the 1807 castle was reduced to ruins by 1942 when its roof and interior became damaged by fire during World War II. A likely contributor to the demise of the castle's roof was how there was a small camp near the castle which was used for training by the SAS or Special Air Services during that time. Regardless, those areas of Loudoun Castle were never fixed after the war to this day. Consequently, the Loudoun Castle Theme Park was modeled in its own structure to be set around its namesake castle. Regarding the service help provided by the park, it staffed 11 full time workers and 160 seasonal jobs per year. As for the expected amusement park attractions, the park also featured live shows and a petting farm in its tenure along with being a possible historical destination for visitors. 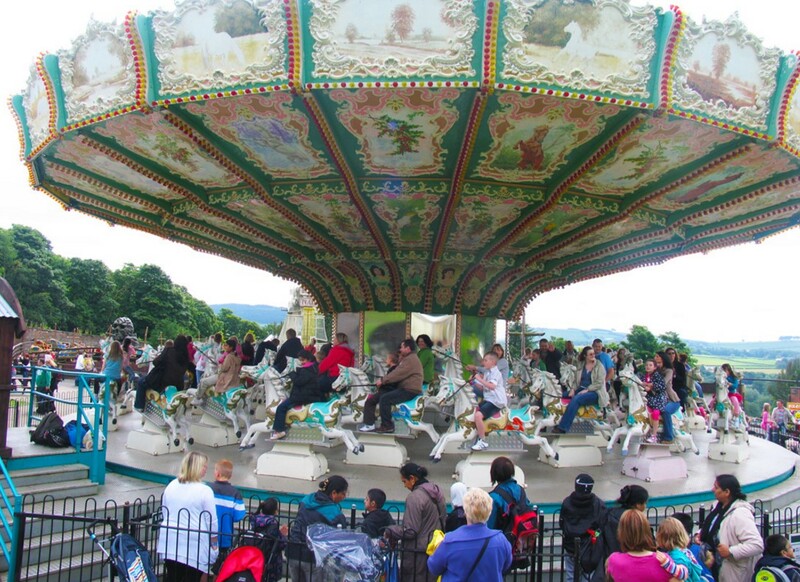 However, it was in Loudoun Castle Theme Park's rides that garnered the park's largest and main audience of children and teenagers. Indeed, the park's various rides ranged from thrill rides to roller coasters in order to satisfy its customers. Regarding the roller coasters that were present at Loudoun Castle Theme Park, there was the Gold Rush which was a Four Man Bob type roller coaster created by the German company Zierer. Next was the Rat which was designed by the steel company Maurer Sohne to be a Wild Mouse type roller coaster. Slytherin' served as the park's Jet 400 roller coaster and was the brainchild of German engineer Anton Schwarzkopf. Then there was Twist 'n' Shout for the park's looping roller coaster and also developed by Schwarzkopf. Finally, Wacky Worm was a ride for children as the park's junior roller coaster by I. E. Park. For the thrill rides at Loudoun Castle Theme Park, the Barnstormer was a drop tower that was relocated from the former Pleasureland Southport Park. Next the Black Pearl served as a pirate ship ride for Loudoun Castle Theme Park. The Captains Wheel on the other hand functioned as an enterprise ride. With Chair-O-Planes rides, the park hosted the largest in the world called the Plough. As for the Crow's Nest, it was the park's troika ride. The HMS Flora McDougal offered its own thrills as a swinging ship ride. Then there was Logger's Leap which was the park's log flume. Lastly, the Milk Churn entertained riders as a round up ride. However much Loudoun Castle Theme Park had to offer tourists and thrill seekers alike, the park ran into trouble with financial issues. From 1995, the park's attendance reached its highest point in 1997 with 225,000 visitors before dropping down in 2003 to 110,000. This was in contrast to expectations of the park's owners who overestimated the amount of visitors to the park for a smaller area like Scotland. Worse still, the inclusion of new rides to the park every year only resulted in more difficulty to provide payment. Furthermore, the size of the park also meant higher prices in maintenance, putting a strain on resources. A greater strain than money eventually came upon Loudoun Castle Theme Park in 2007 which threatened the park's image of being safe. It happened on July 15 of that year when one of the ride operators of the Rat, 18 year old Mark Blackwood, was performing maintenance. After pushing the roller coaster when it got stuck, Blackwood fell 80 feet before dying the next day in the hospital. The incident led to a two week trial where the park owners were found not guilty of failing to provide training for Blackwood. Nonetheless, there were rumors that the park might close after all due to the tragedy. As it turned out, Loudoun Castle Theme Park did close its gates in September 2010 as was discovered by the media. Even so, the reasoning given by the park's last owner Henk Bembom for the closing was not because of the death as it was over the park being "no longer economically viable." Local accounts also went on to imply how the park "never made a profit" during its years under Bembom. All the while, the only significant activity that surrounded the park since 2011 was either debates over certain rides being taken somewhere else or other rides simply laying there and collecting rust. 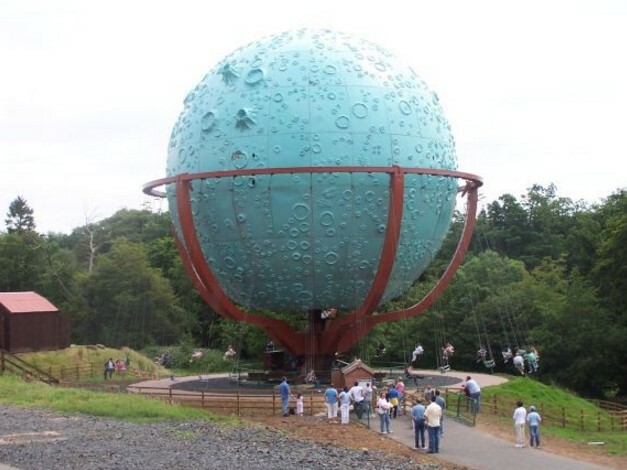 Two messages on the future of Loudoun Castle Theme Park have been uncovered online since 2010's proclamation that eventually operation at the park would come back. In 2013, there was an announcement that there was a potential redevelopment plan for the park as a golf site. Then in 2014, yet another announcement was made, saying that fixing the park was to begin in 2016 with reopening the park altogether in 2018. But either way, both possibilities equally reveal that nothing has been set in stone for the park or its castle yet as of this writing. 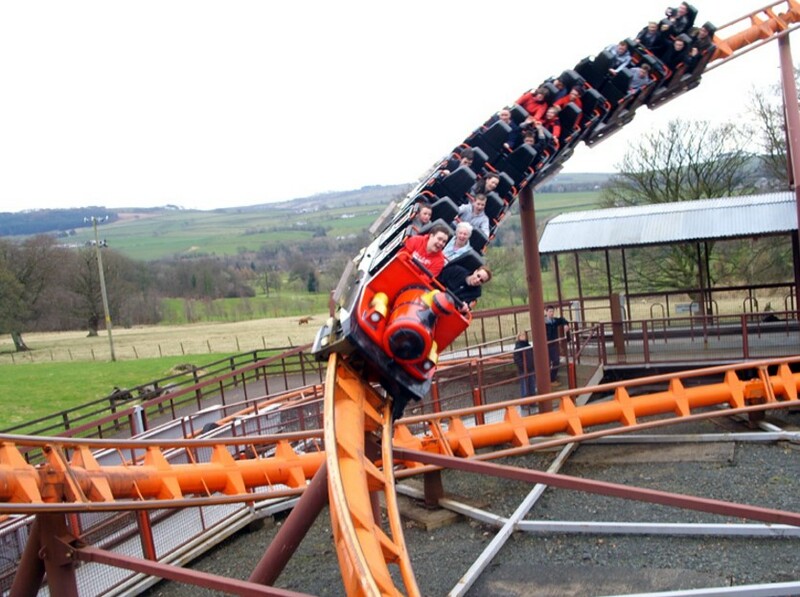 With the magnificent and imposing ruins of Loudoun Castle as a stunning backdrop, the Theme Park is unique, with a safe and clean environment where there are New Rides and entertainment, to suit all ages. New live shows featuring 'Rory & The Gang!' run throughout the day, everyday we are open. Come and join in the fun! Down at the Castle there's a wonderful new display of 'Birds of Prey'. Featuring the only Ruppel's Griffon Vulture in Scotland. What a grreat idea! Celebrate your Birthday with Rory! We can cater at the Coach House' for that special birthday party. Ask for details of pricing and catering and leave the rest to us! It's bound to be a brilliant day to remember. Why not have your 'Corporate Fun Day' at Loudoun Castle! Imagine...enjoy the park during the day and when it closes it's all yours til late! We can cater for all tastes from Bar-B-Q's to buffets in a special Marque or in our comfortable, licensed 'Coach House' restaurant. Special events tailored to your needs including: Go Kart Grand Prix or Live Music! Anything goes. Our customers let us know how much they enjoyed the Theme Park.